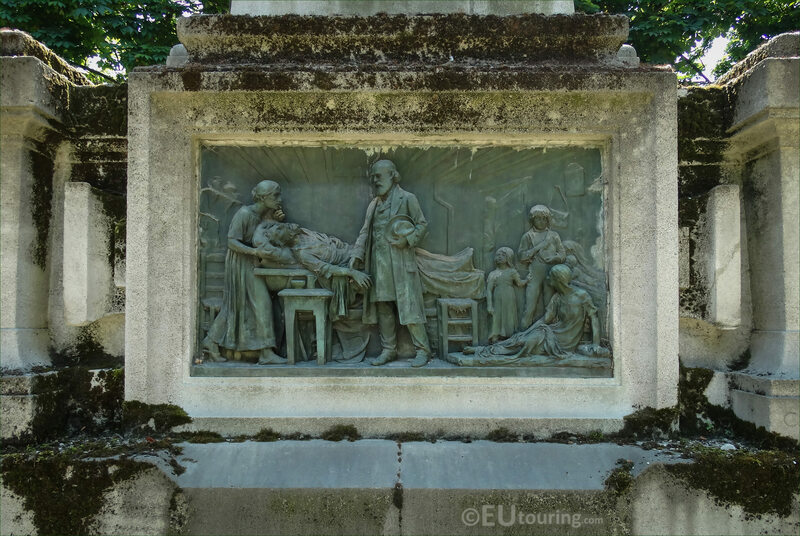 Again we were at the Square Jacques Antoine in the 14th Arrondissement of Paris located within the Place Denfert-Rochereau, when we took these high definition photos of a bas relief on the Monument to Raspail, which was sculpted by Leopold Morice. 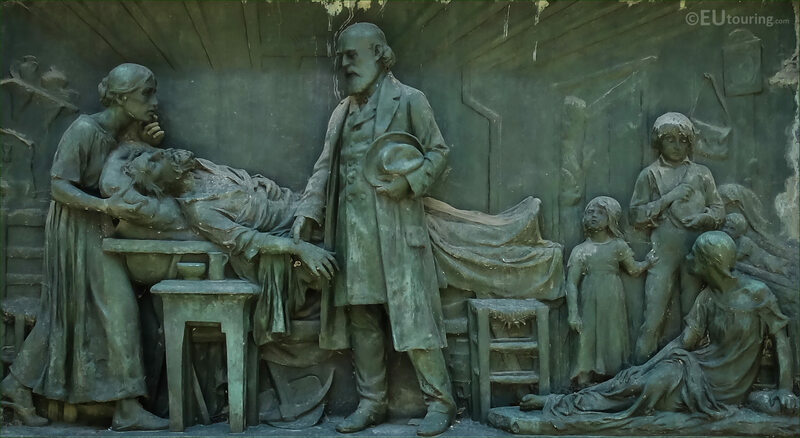 This first HD photo shows a bas relief, which was sculpted in bronze by the artist Leopold Morice, and was part of the Monument to Raspail that was executed between the years of 1897 and 1899. 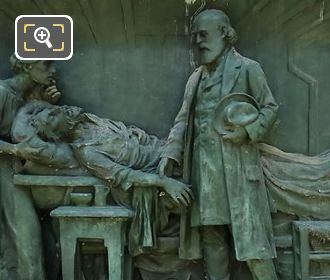 Now this particular bronze sculpture depicts Francois Vincent Raspail as a physician, who was an advocate of hygiene, proper sanitation and diet, being one of the early people to utilise the microscope and he was also as an advocate for antiseptics to help again sepsis. Plus Francois Vincent Raspail was one of the founders of cells theory within biology. Yet, he was also a politician, and the bas relief sculpture on the opposite side of the monument depicts him as this, although unfortunately the bronze statue depicting Raspail that was once positioned on the top of the monument was melted down during the German occupation of Paris. 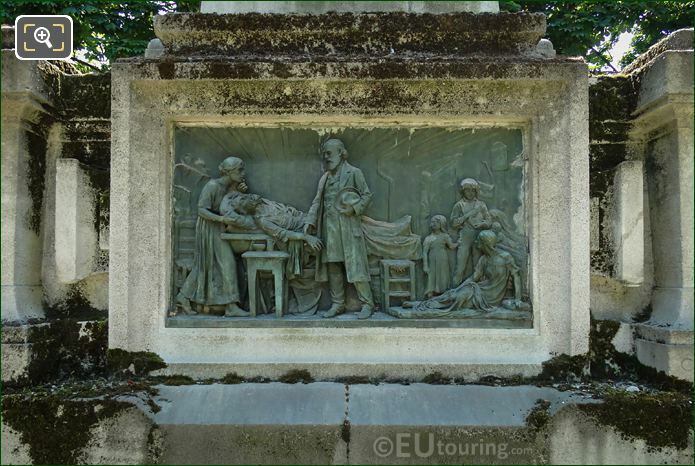 So this close up image shows the detailing that went into producing this bronze bas relief with Raspail check the mans pulse, and as we mentioned earlier, it was sculpted by Leopold Morice, who was born in Nimes, yet went to Paris to study at the Ecole des Beau Arts under Francois Jouffroy. During his time there he received numerous awards, and was provided with several public commissions for tourist attractions such as this monument, statues on the Pont Alexandre III, and his most famous one called The Republic, which was designed by his architect brother, yet executed skilfully by Leopold Morice and positioned at the Place de la Republique in Paris. Yet this last photograph shows the entire Monument to Raspail, which is located within the Square Jacques Antoine and is one of the gardens at the Place Denfert-Rochereau in the 14th Arrondissement of Paris. 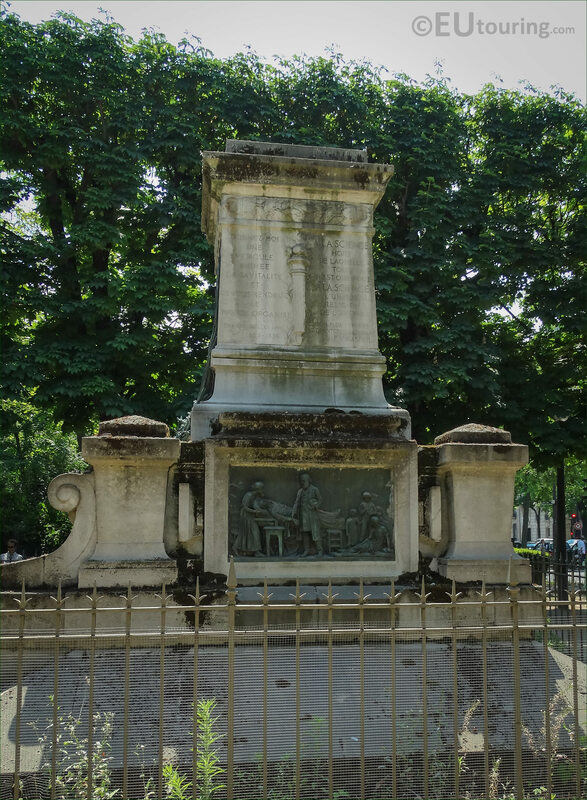 But, this can also be found very close to numerous other tourist attractions in Paris including the Lion of Belfort statue, the Catacombes and the Barrier d'Enfer buildings, all within a short walk of each other.